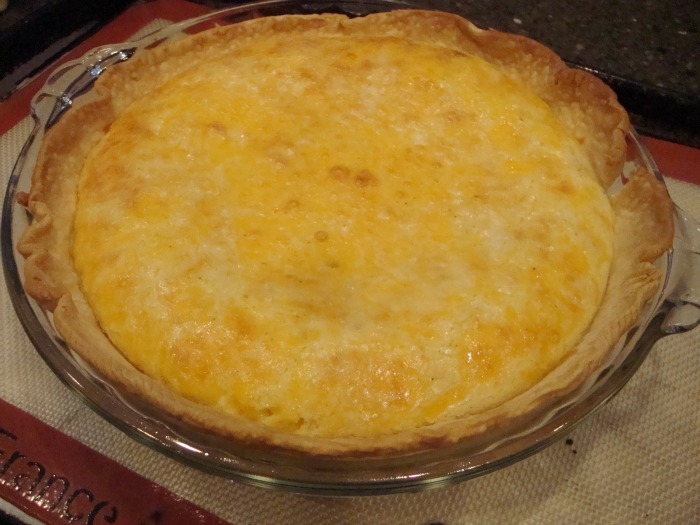 Easy Ham and Cheese Quiche - Chocolate Chocolate and More! 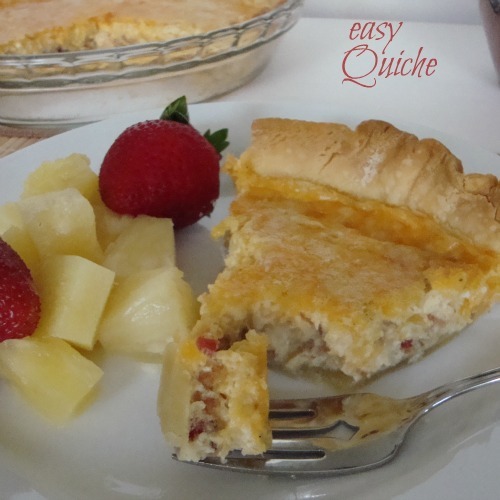 Easy Ham and Cheese Quiche is great for breakfast or lunch! I love quiche. I always have. Perfect for a light lunch. In a house full of kids, it’s nice to have something grown up every now and then. Just for me. But you know, my kids love this almost as much as I do. And so simple to make. Once you’ve made your first quiche, start changing things up, instead of ham, how about some broccoli, or some roasted peppers? Left over steak is amazing in a quiche. Quiches are a great way to use clean out the fridge. Play with the cheese. Cheddar, Swiss, how about some Gruyere. Don’t worry if it’s not shredded, just slice thinly or chop it up. If, by chance, you have some left over, it’s easy to reheat. I just wrap a slice in foil and pop it in the toaster oven for about 5 minutes on 350. *Moderate your salt based on the saltiness of your meat. Preheat oven to 450 degrees. Lightly spray a pie plate with cooking spray and place pie crust in dish. 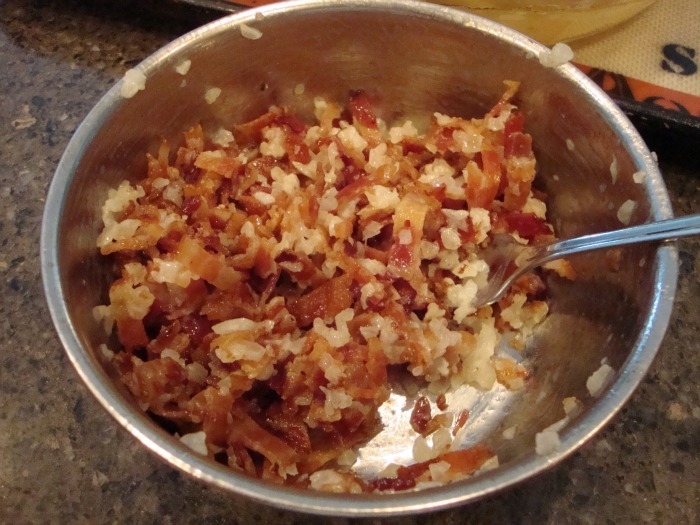 Combine sauteed onion with meat, I used some leftover bacon. 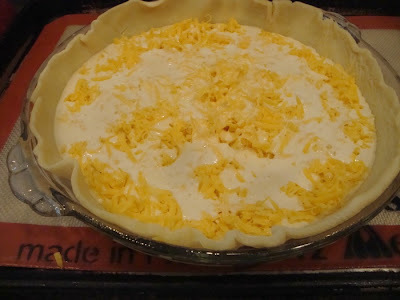 Layer meat on pie crust then sprinkle cheese over top of your meat layer. Whisk together eggs, flour, Worcestershire sauce, salt and pepper. Gently pour egg mixture over over meat and cheese. Don’t worry if egg doesn’t completely cover everything. Place in preheated 450 degree oven for 10 minutes than reduce heat to 325 degrees and continue baking for about 20 minutes more until firm and just golden on top. Looking for another fast brunch idea, be sure to check out these Breakfast Tartlets. I’m sharing this at some of these great parties. Love quiches! They’re one of my favorite foods for breakfast and dinner. Mmm! This looks really yummy! I love quiche. We used to always have it growing up, but I’ve never made it. Pinned! Thanks for sharing at Terrific Tuesdays. I always forget about quiche! And you are right they are so fun to play with the different combos!!! I love this!! So light for summer a brunch. Thanks for sharing on Southern Sundays. Hope to see you again tomorrow. !